The opening performance of the night is by “Gypsy at Heart”, a world music group based in Atlanta and Athens that weaves a fusion of eclectic musical genres from Classical Indian Ragas and Middle Eastern scales, to Latin, Celtic, European Classical, and American Folk and Jazz. They are known for their original compositions; blending improvisations that are spatial and beautiful; flowing into movements breathtaking in intricacy and speed that take audiences on a musical experience. “Gypsy At Heart” comprises of Joseph Leone on guitar and vocals, Souryadeep Bhattacharyya on the Sarod, Rohit Bhat on Tabla and Jeremiah Rag on Oud. 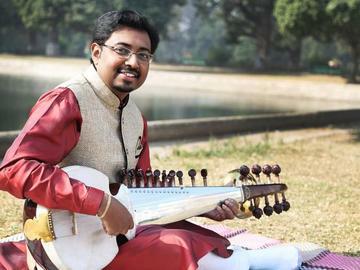 This special concert organized by Aarohi thus comprises of two sarodiyas, Abhisek Lahiri and Souryadeep Bhattacharyya, incidentally under the tutelage of the same guru Pt.Alok Lahiri and presents to everyone a sumptuous musical platter varying from serene Indian Classical Music to eclectic World Music. The concert will take place at the Georgia Tech Student Center Theatre on Thursday evening, April 14th. Doors will open at 6:45 PM and the performance will begin at 7 PM sharp. Admission is $8 for Georgia Tech Students and $20 for general admission. GT Students must show valid I-Card as proof during event entry .